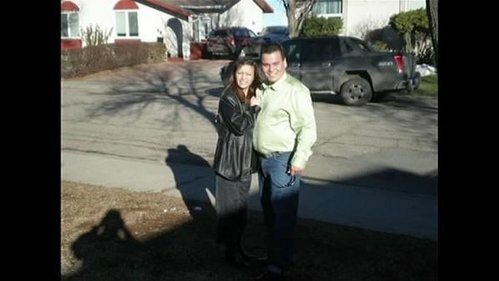 CBC News is tweeting live from the courthouse at the first-degree murder trial of Tammy and Kevin Goforth. He yelled "Your f---ing family killed them". 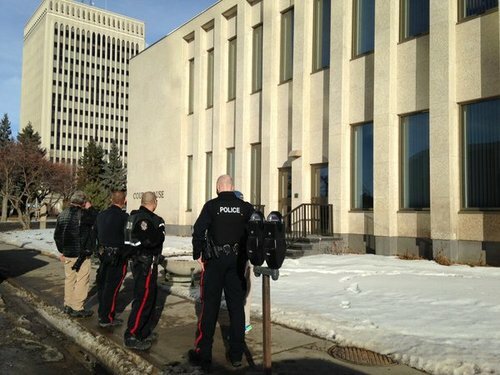 Just as quickly, that man was removed by sheriffs and Regina police are now in the hallway. The boy described "happy little girls," who were "quiet, soft-spoken, kind of shy". Said they seemed 'uneasy' around visitors. He said he saw them a couple nights before July 31 2012, during supper time. "It was just a normal supper. It didn't seem unusual"
At first he said "just the four of us" but corrected himself to five, then six, including another boy and the two accused and two victims. Confirms to the defense lawyers that they were introduced to him by name but that he was unsure about the younger girl's name. Boy says "she would go use the washroom". Describes picking up younger girl from goforth house, taking her to Tammy's mother's July 31. "She seemed fine" he said of that night. "She seemed not really more quiet than usual but she seemed a little scared." The boy says he knows tammys mother got her a cup of water, then says she fed her canned soup. Answers he didn't see any sore on girl's leg. Crown asks boy about the girl's looks on that night. "On the face she had chubbier cheeks," he says. Crown- did that ever change? Boy: "No."
. @lnameth57 no but I have a live radio hit at noon and had to leave the courtroom to make the phone call.
.@CBCSask and defence also confirms that Kevin Goforth will also testify as a witness.